My work draws on influences from the world around me from film, art, travel and popular culture. I like to use colour, shape and a sense of playfulness in my work to create unique and special pieces. My love for creating jewellery surfaced when i was in my early 20's and would spend hours making jewellery out of beads and non precious materials. I then decided to take it up a notch and learn how to work with precious metals. 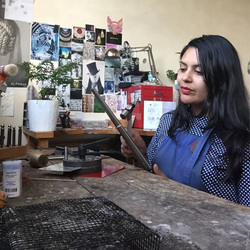 I successfully completed an Advanced Diploma in Engineering Technology (Jewellery) at NMIT in 2008 and have since set up a studio in Brunswick where I hand make each piece of jewellery. I mainly use Sterling Silver as my choice material, I find its finish a perfect match with bright colours I use in my work. I also work with acrylic in my other jewellery business Paws & Effect.